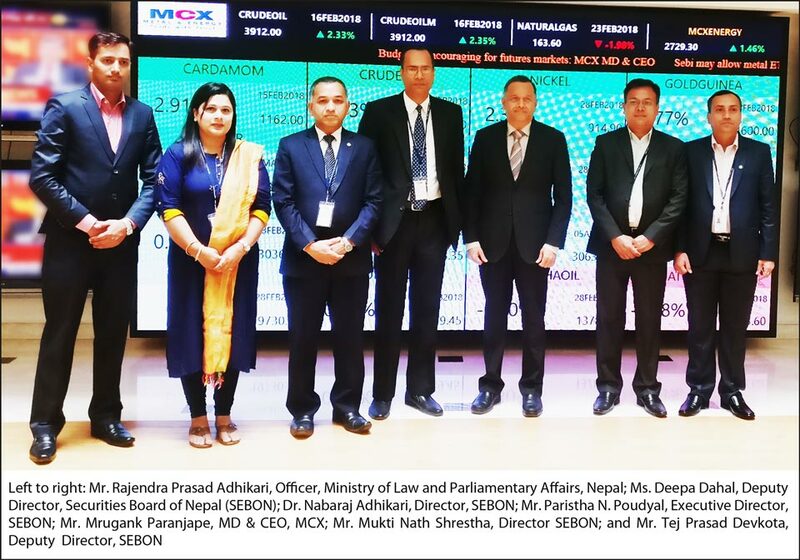 Mumbai, February 15, 2018: A delegation consisting of senior officials from the Securities Board of Nepal (SEBON) and Ministry of Law, Justice, and Parliamentary Affairs, Government of Nepal, have been on a week-long working tour to Mumbai with a visit to Multi Commodity Exchange of India Ltd. (MCX) as part of their study tour on the functioning of commodity derivatives market in an effort to set up a regulatory regime and to launch commodity derivative markets in Nepal. The Government of Nepal has recently entrusted SEBON with the responsibility of regulating their country’s commodity derivatives market, and SEBON intends to acquire knowledge about market structures, products, processes and various regulatory aspects connected to commodity derivatives during their study tour to India. As in many countries in South Asia, Nepal’s economy is also heavily dependent on production, trade and exports of commodities, especially agricultural commodities. Agriculture is the main source of GDP, employment, and exports of the land-locked country, although less than 20 percent of its area is arable. Through appropriate institutional support for marketing, price discovery and price risk management for agricultural commodities, which can be achieved by strengthening the commodity market institutions, the government and its agencies hope to empower all stakeholders connected to this sector. The study visit of the delegation is intended to assimilate critical learnings from India’s experience in creating such institutions and the successes have brought in. 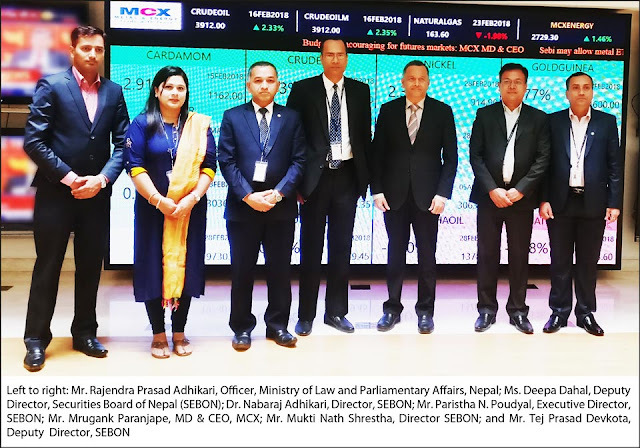 Mr. Paristha Nath Poudyal, Executive Director, SEBON said, “It is an enlightening experience for us to learn about market development and regulation of commodity markets from MCX, India’s largest commodity exchange and to reap the synergies between Nepal and India’s commodity sector. We are sure we would be able to acquire key learning about the nuances of commodity markets, which would enable us to create the proper regulatory framework for orderly growth and development of Nepal’s commodity market”. During their study tour, the delegation met the physical market traders and member brokers of MCX. They are also scheduled to interact with the senior officials from Securities and Exchange Board of India, and Reserve Bank of India.